Hey foodie friends! I’m going to let you in on a little secret. 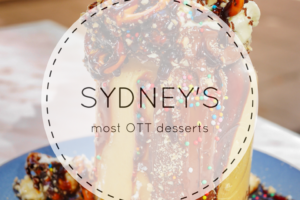 If you’re into good food, interesting history and having fun (and who doesn’t want all those things? 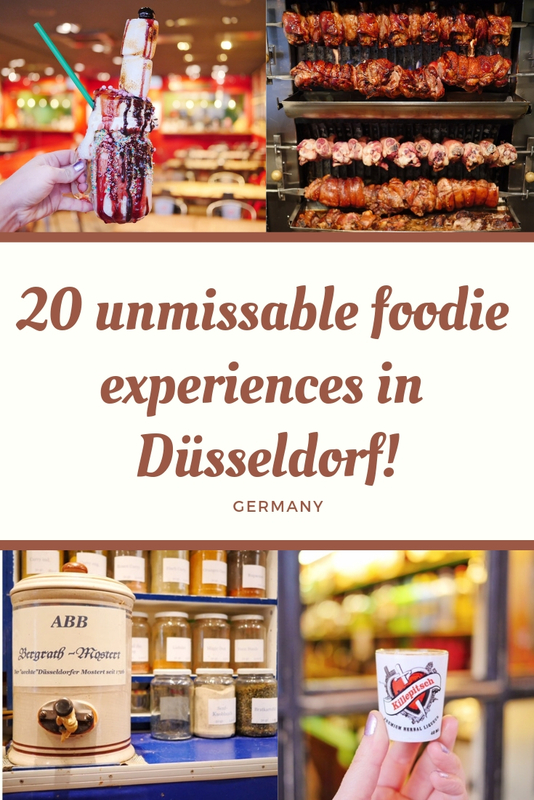 ), you better add Düsseldorf to your list of cities to visit now! As someone with a major sweet tooth, I often spend my time in German cities hanging out with friends and learning about the culture and history because there’s only so much sausage and sauerkraut one girl can eat! 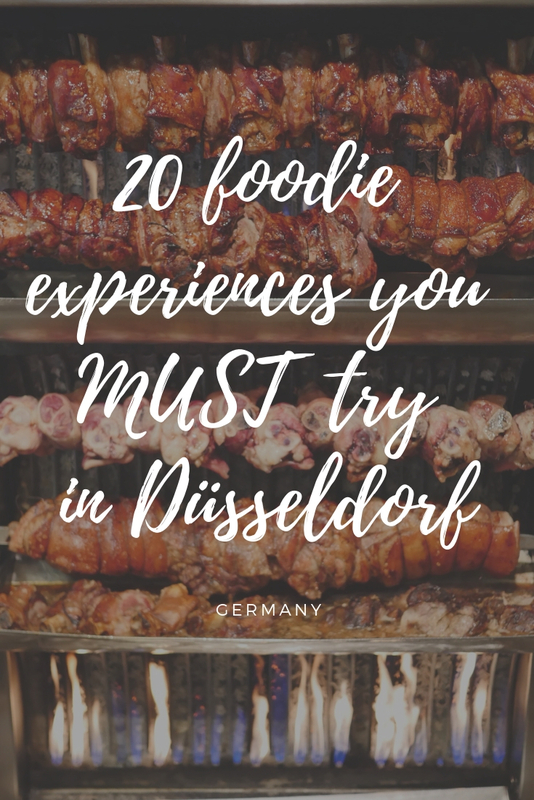 Then, I started hearing whisperings about Düsseldorf and its vast and varied foodie options. I learned that they have a rich multicultural community and those communities brought their food traditions with them. And when I heard my local friends talking trash about other German beer, I just knew I had to visit for myself to find out if it really is as good as the locals say. I stayed in the city for about a week, visiting friends and touring with Visit Düsseldorf. I ate and drank to my heart’s content and can say with confidence that it’s not just as good as the locals say… it’s better. Note: This post contains affiliate links. If you purchase using the links provided, I will earn a small commission at no extra cost to you. Want to make enemies of a Düsseldorfian quickly? Tell them that Kölsch is your favorite beer. 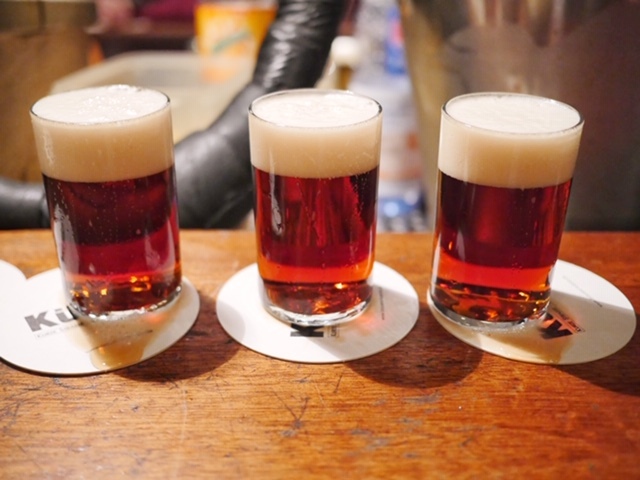 The long-standing rivalry between Cologne and Düsseldorf is most apparent when talking about altbier vs. the “dirty dish water” from their neighbor to the South (I’ve been hanging out with locals, obviously). 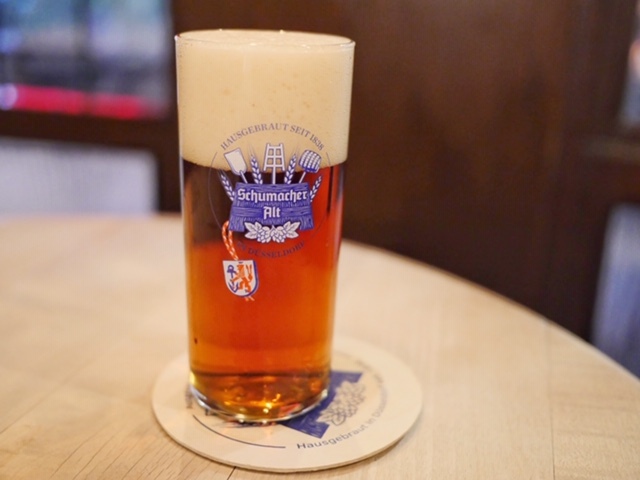 Altbier translates to “old beer” because it’s made in the old top fermenting style of brewing. Germany’s beer purity law allows only water, hops and barley (and now yeast) and is one of the oldest food laws in the world. 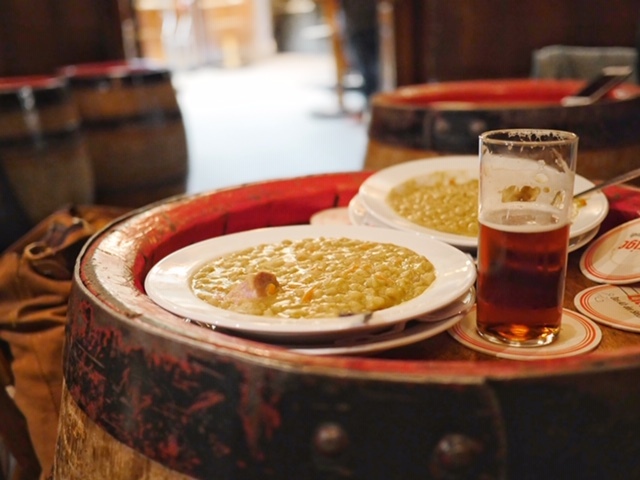 A visit to the Altstadt isn’t complete without a visit to Uerige, a craft brewery that’s been creating the most famous beer in Düsseldorf since 1862. Watch your toes as barrels of beer are rolled through the brewery. And if you don’t want a refill? Pop your coaster on top of your glass to signify that you’re done. Take your tastebuds on a time-traveling journey from old altbier to Kürzer, the first altbier brewery to open in the Altstadt in 148 years. It’s a happening place for the younger generation because of its less bitter taste. Did you know that you lose the ability to distinguish bitter flavor as you age? This might explain why Uerige typically attracts an older crowd. Want to try it all? 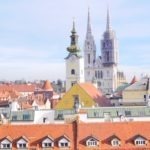 Join a German Tour through the Old Town with Beer Tastings or a 3-Hour Beer Tour with Local Dishes. 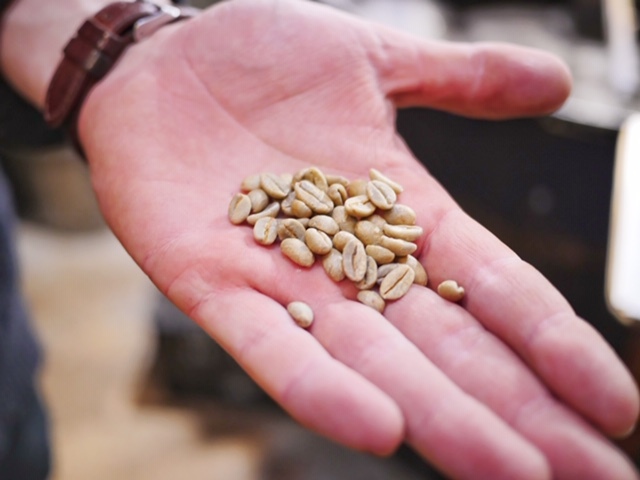 At Rösterei Vier, beans are roasted daily in batches of up to 10kg to ensure perfection every time. When you sip that smooth cup of joe, you can be sure exactly where those beans came from. It says so right on the menu. 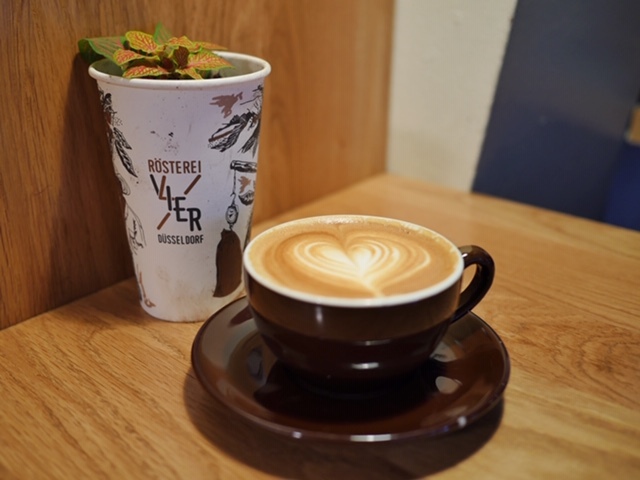 The roasters in Düsseldorf’s old city have formed partnerships with small farms around the world and work directly with the farmers to ensure quality of beans and quality of life for the workers. When you choose a takeaway cup, a €0.10 fee is added, which is used to plant a tree in Malawi to help aid reforestation efforts. Over the years, they’ve done great work with hygiene and sanitation efforts as well. Renting a glass water bottle at Rösterei Vier is €1.50, which is refunded upon return. Many guests choose to donate that change to the Malawi well-building fund, Kumanga. And while doing good is great… taste matters. And in this case, the taste is great. In fact, it’s one of the first coffees I’ve tried which was so good, there was no sugar needed. My latte was made with locally roasted beans and milk from a local cow. It doesn’t get much better than that. 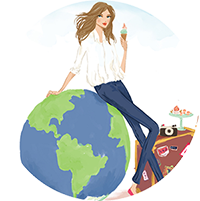 Germany isn’t known for its sweet treats, but thanks to Anna Maria Luisa de’ Medici (who married Johann Wilhelm II) brought la dolce vita with her. 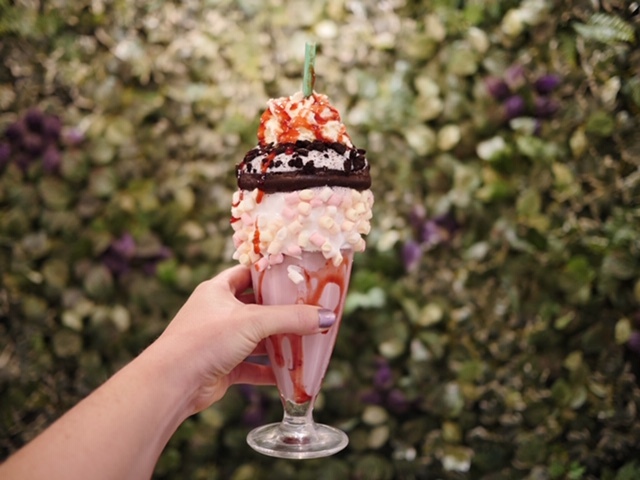 Desserts in Düsseldorf seem sweeter than elsewhere in the country and there’s a market for the popular food trend, freakshakes! 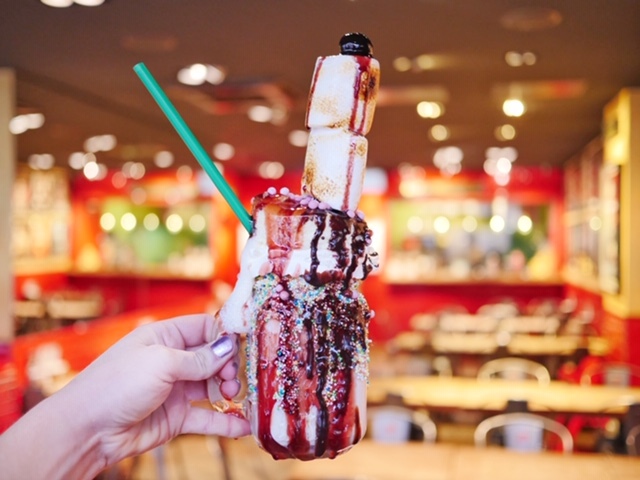 I’ve tried freakshakes in Dallas, Texas, Melbourne, Perth, Sydney and Darwin, Australia, London, England and Manila in the Philippines. I paid a visit to Flakes Corner and loved their strawberry shake decorated with mini marshmallows and a donut on top. They were out of their usual strawberry-iced donut and I was stoked when the replacement was a cream-filled cookies ‘n’ cream donut that came out warm. I don’t know what ‘normal’ is, but this was awesome! As somewhat of an expert in the field, I think I’m qualified to deem the freakshake at What’s Beef? as the best in the world. I tried the NY Cheese Shake, which came topped with a perfect round of cheesecake that was fresh and creamy and delicious. I felt like I was back in the US when the shake came topped with toasted marshmallows and berry pearls. 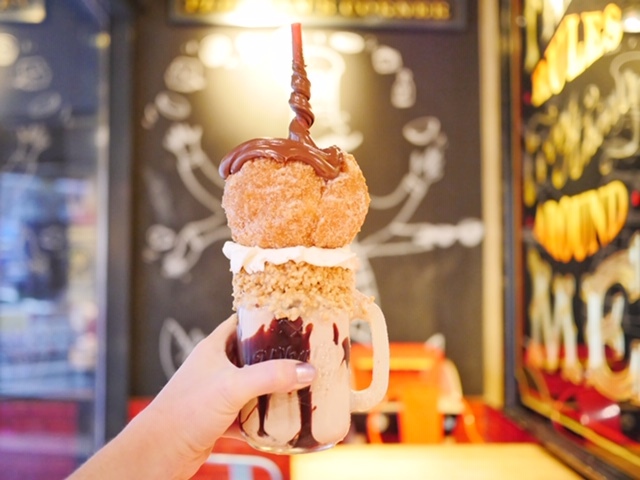 My friend tried the Nutella Donut Shake, topped with the freshest donut I’ve ever seen on top of a freakshake. Perfectly fluffy on the inside and crispy, sugar-coated heaven on the outside. 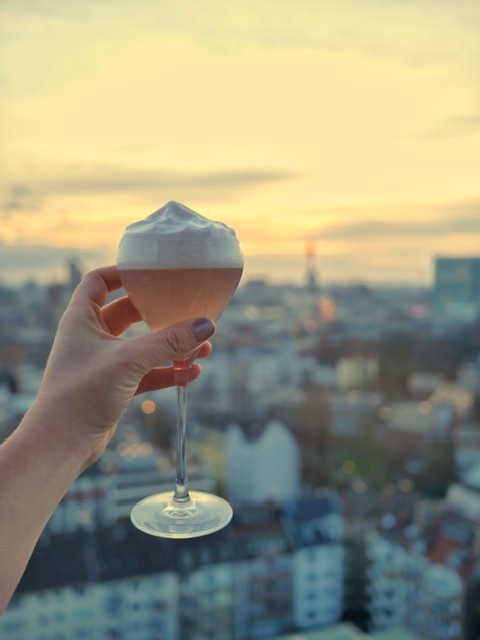 25Hours Hotel opened just over a year ago, but they’ve quickly made their mark on Düsseldorf’s drinking scene. I got the chance to sit on the 17th floor at The Paris Bar and learn all about the art of #frinching (French drinking). 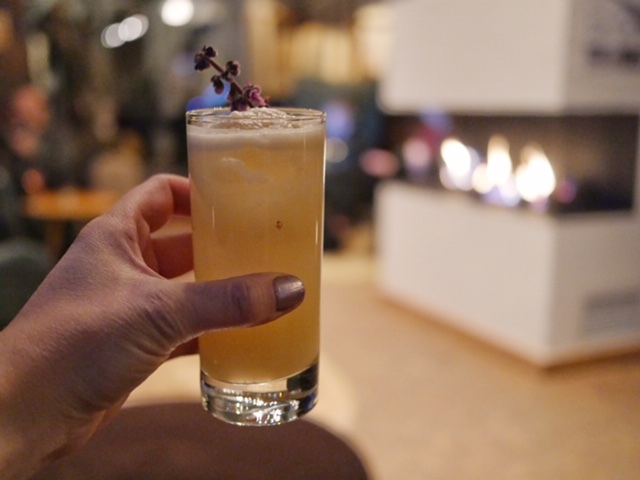 I enjoyed a beautiful sunset at I tried COCO BEFORE CHANEL, which combines Naud VS Cognac, transatlantic coconut syrup, sushi ginger, ginger beer & (of course) elegance. Next up, I sipped AVIATION by the fire. The combination of Citadelle Gin, lemon, maraschino, violette foam & wings. The views of the city are stunning and the perfect atmosphere to perfect your #frinching skills! Did you know that there are 11,000 Japanese people who live here in Düsseldorf? That’s a huge increase from the one Japanese person who lived here in 1950. 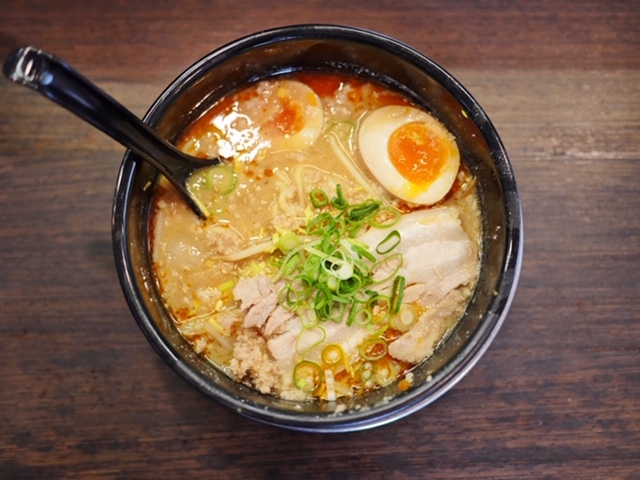 Today, Little Tokyo is full of incredible, authentic Japanese restaurants to feed the families who are permanent or temporary residents or German-born citizens of Japanese ancestry. 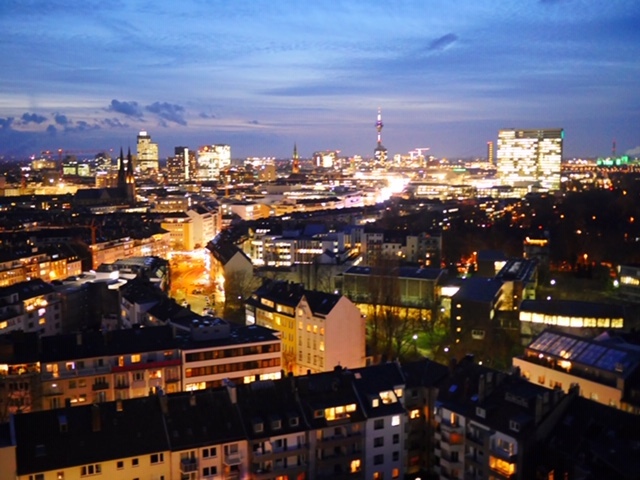 In the past 69 years, over 500 Japanese companies have chosen Düsseldorf their base. A local friend recommend that I visit Na Ni Wa Noodles and Soups, which often has lines out the door, where hungry patrons wait nearly an hour for a bowl of noodles. When I visited at 2pm, I was seated right away. I asked for the most popular dish, and ordered the recommended Tokusei Miso with an added egg. Pro Tip: It’s not on the menu, but if you have a small appetite, you can order a small bowl for a reduced price. 6. Let’s get this bread! A phrase that’s the motto of go-getters at the office and carb-hungry patrons at Bäckerei Hinkel. With 35 bakers creating both high quality and an enormous quantity of bread, this shop is where bread lovers go to buy sweet and savory bread. 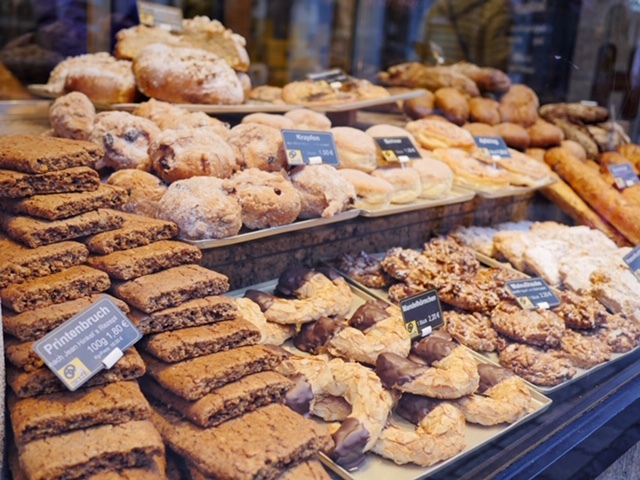 It’s estimated that 1% of bakers in Germany have been trained at Bäckerei Hinkel. At this family shop, the current owner still uses the founder, his great grandfather’s, gingerbread (printenbruch) recipe from his hometown of Aachen. During WWII, Willi Busch sat in an air raid shelter with his friend Hans Müller-Schlosser, where he promised to meet up with his friend for a drink if they both survived. The message was “If they don’t ‘KILL’ us now, we will have a chance to ‘PITSCH’” (local vernacular for drink).” And in 1950s, “Killepitsch” was introduced to the public. Prior to that, the all-natural liqueur made with 90 herbs, spices, fruits and berries was a Busch family secret. 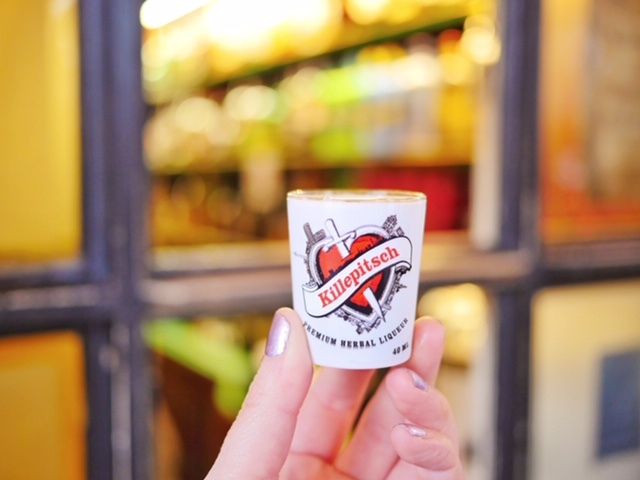 Today, you can try a shot at Et Kabuffke Killepitsch Stube or buy a souvenir bottle at the Killepitsch shop next door. Be warned, though, this shot is not for the lightweights! First mentioned in 1628, Restaurant Zum Schiffchen is the oldest restaurant in Düsseldorf. Since then, many notable figures have passed through the doors including Napoleon in November 1811 when Düsseldorf was made capital of the Grand Duchy of Berg region. I highly recommend the haxe, but come hungry! Test the quality of a haxe by tapping the non-serrated side of the knife on the pork crackling. Hear a hollow knocking sound? Perfect! If it’s gummy, you’ll know that the haxe has been microwaved and that is not a meal fit for an emperor (or even a tourist). 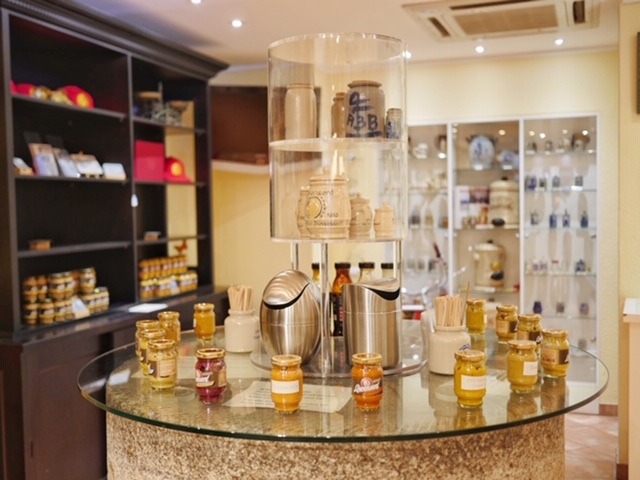 Pay a visit to Düsseldorfer Senfladen where you can sample several flavors of mustard including honey, coconut curry, cherry and baked apple among others. The ABB mustard is nothing new. It’s been around since 1726 and if you check out Van Gogh’s ‘Still Life with Bottles and Earthenware,’ you’ll see it’s been popular for quite a while! 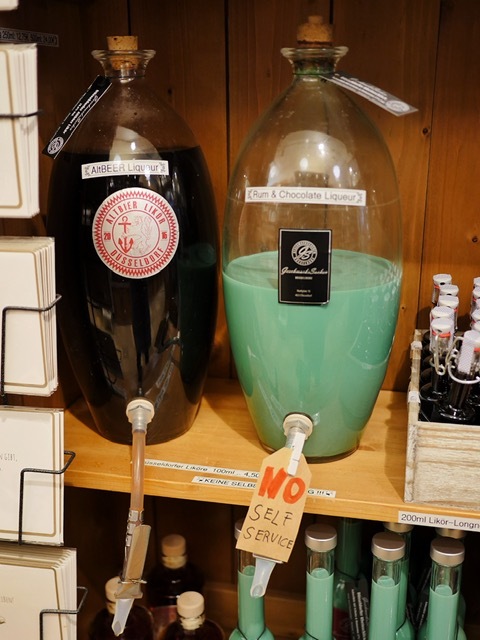 Bring your own bottle to Gewürzhaus Altstadt for a refill of ABB mustard. While you’re there, fill up on your supply of spices, where you can buy exactly the amount you need instead of investing in an entire bottle. After the war, deep fried pizza was invented as an answer to many people without ovens. Stipes frittierte pizza is keeping the tradition alive today, catering to fried food-lovers and the late-night party crowd. Not a fan of fried food? They offer regular pizza, too. 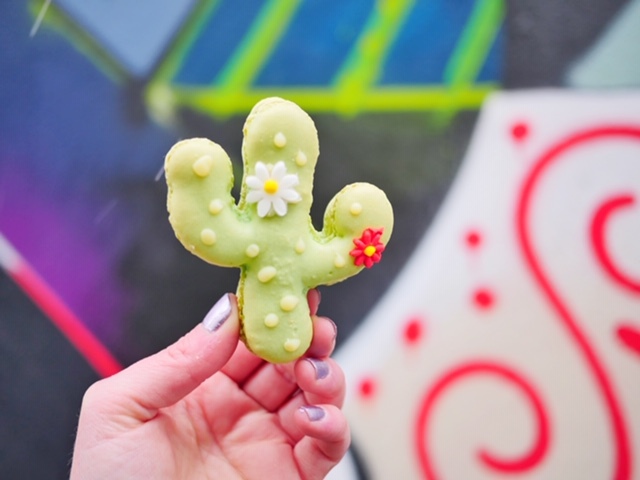 Step inside Sugarbird Cupcakes and feel transported to a happy place, where childhood dreams of colorful cakes come alive. For six years, this cute cafe has been baking up happiness in the form of cupcakes, cakes and macarons. 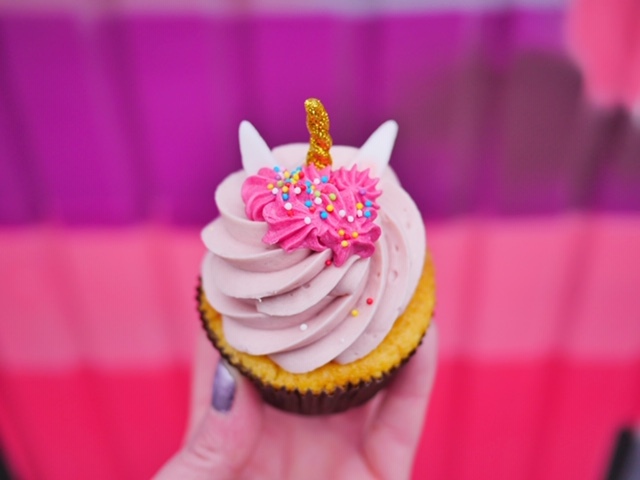 Stop in for a classic chocolate cupcake filled with white chocolate or opt for a glitter-horned unicorn piñata cupcake stuffed with mini M&Ms. I love the colorful designs and the menu that changes by the season. Stop in often to see their newest creation! 13. Sip on… the silt of the Rhine River?! 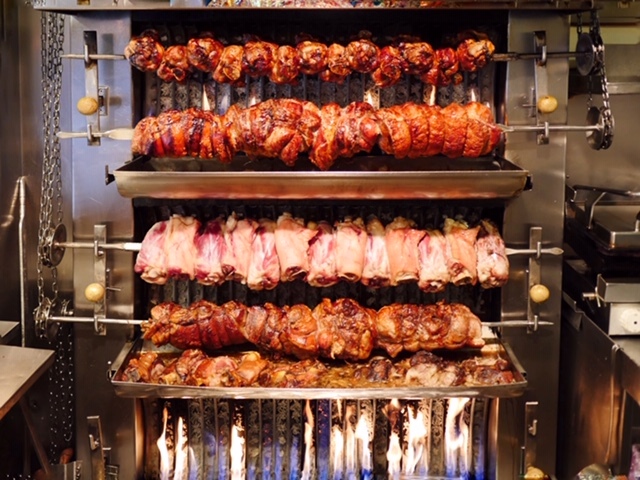 When you set foot inside GeschmacksSachen, you’re immediately surrounded by glass dispensers of all shapes and sizes containing a variety of culinary delights. What first caught my eye, though, was the muddy green Rhineschlick. The color of the rum and chocolate-flavored liqueur is reminiscent of what you might find at the bottom of the famous river that runs through the city. I haven’t compared, but I’m certain this Rhineschlick tastes much better than anything you’d collect from the Rhine itself. 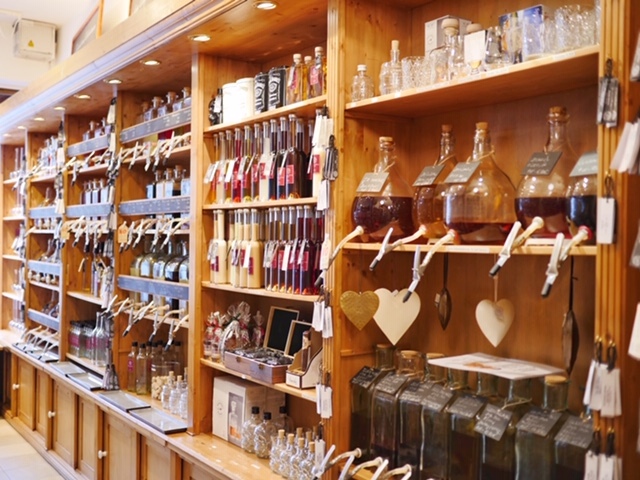 Peruse the shop for unique fruit brandy, with flavors like quince and fig, before moving on to absinthe gin, spirits and Scotch on tap. For a very Düsseldorf salad, bring home a combination of Altbier vinegar and lime oil for a salad that’s reminiscent of this amazing city- a combination of different flavors that just seem to work. Continue on to the GeschmacksSachen mustard section with Altbier mustard and Rhine pearl mustard with the texture of caviar, curated especially for this shop. And don’t forget the candy section! Altbier candy is a unique treat you won’t find anywhere else. 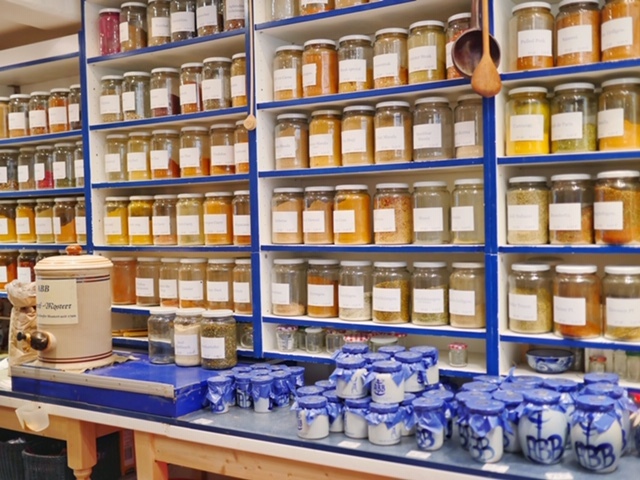 I had a lovely chat with Jens, who has been working at the shop for several years and his passion about the local products made this shop visit a very special one for me. #FoodPorn isn’t just a hashtag on Instagram. Düsseldorf’s newest addition to the brunch scene is Cafe Buur, with a very Instagrammable menu. 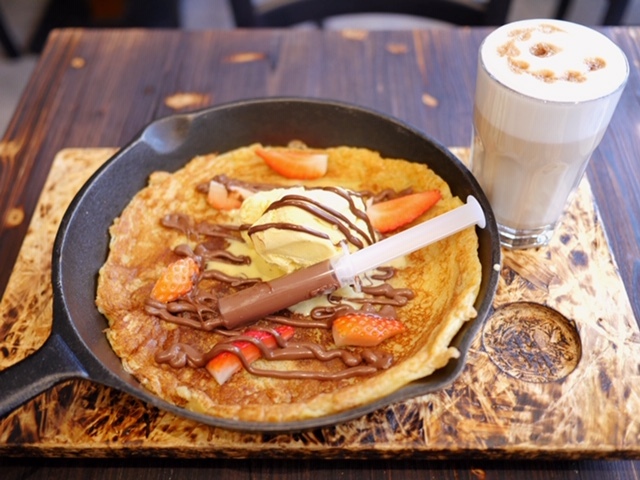 I recommend the #FoodPorn, a fluffy pancake served in a giant skillet with ice cream, drizzled with Nutella and served with a syringe of Nutella (because you never can have enough). Pro tip: Skip the strawberry add on. The pancake is awesome without them and €2 for what amounted to less than two strawberries isn’t worth it in my book. Napoleon was only in Düsseldorf for a short while, but the French influence is still evident in some of the dining options. 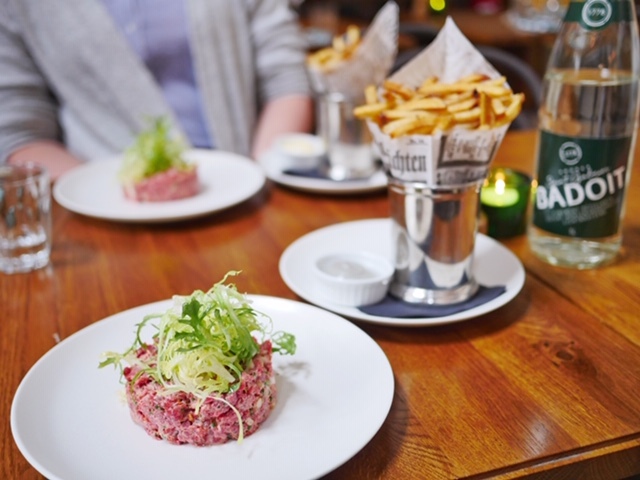 I tried the highly recommended steak tartare at Bistro Sommelier in the Andreas Quartier. As someone who typically eats her steak medium, I was pleasantly surprised by this delicacy. Pro tip: Swap the regular french fries for truffle fries. You’re welcome. Hot chocolate is one of my biggest passions in life and Gut & Gerne fulfilled all of my chocolatey dreams. Choose how dark you like your chocolate (I chose 72%) and add a flavor for an additional €.50. My friends and I tried marzipan, salted caramel in 72% chocolate and peanut butter in white chocolate. And each one of us thought ours was the best. I’ve also been told that the rose and chili flavors are amazing, too. 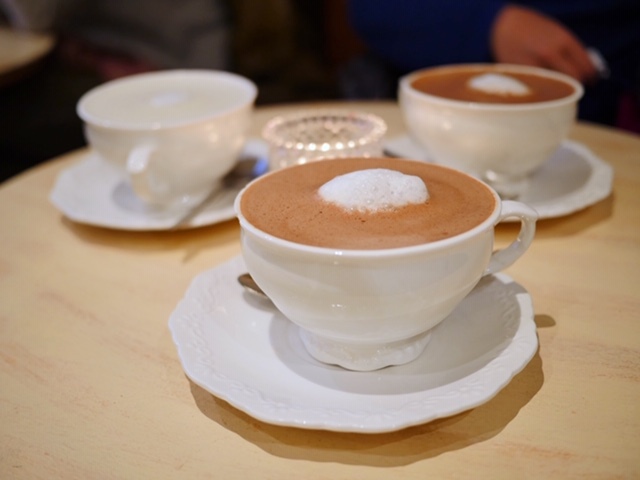 I’d book a flight back to Düsseldorf just for this hot chocolate. In the chocolate shop next door, choose a marzipan figure, chocolate pasta or homemade truffles to take home as a souvenir. At the Carlsplatz Market, locals peruse the stalls, each as diverse and specialized as the next. Visit one stand devoted to Dutch cheese and another with the best falafel in town and yet another that will squeeze fresh juice to order. 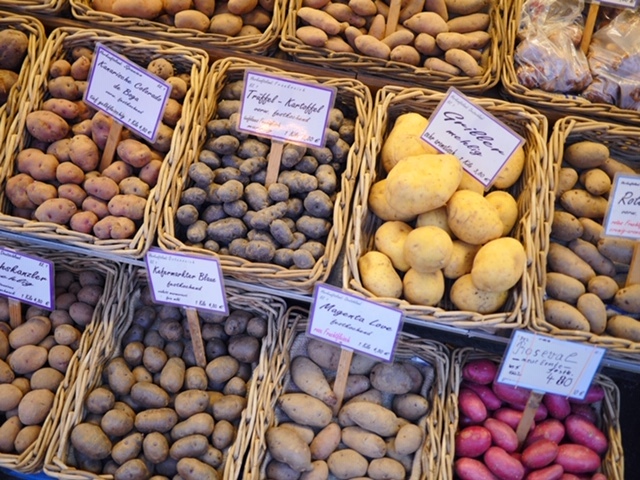 Among the vendors is a potato concierge with dozens of potato varieties. After shopping for the meat you’ll serve for dinner, stop by the potato stand where the expert will guide you in choosing the perfect potato to complement the meal. 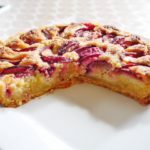 This Culinary Soul guided tour will take you through the market and introduce you to the vendors of Carlsplatz Market. Depending who you talk to, soleier is either a 100% traditional, must-have pub food or a trick Düsseldorfers play on tourists. I prefer to think it’s the former, because I loved this treat that reminded me of deviled eggs at picnics back home in Texas. 2. Cut it in half (top to bottom). 4. Add oil, vinegar and a spoonful of mustard. 7. Enjoy and follow with a sip of altbier! As someone whose feet are rarely on the ground (see Exhibit A), I love that Düsseldorf has a tradition of cartwheeling. 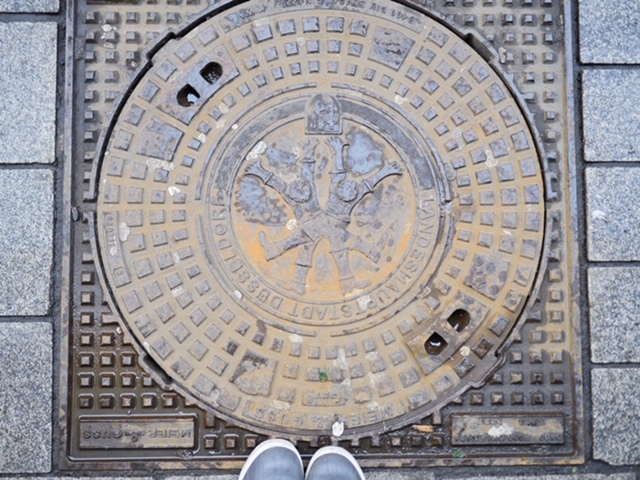 From a yearly cartwheel championship to all kinds of myths about where the Düsseldorf Cartwheeler (Radschläger) tradition began, you’ll spot these fun symbols everywhere. 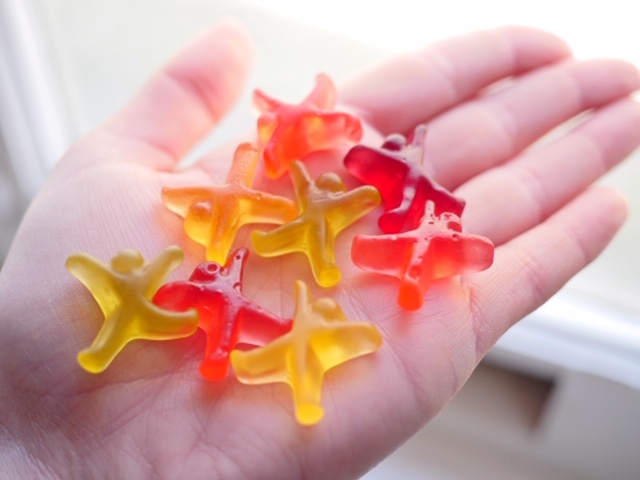 Buy a pack of Radschläger candy to play your part in Düsseldorf’s tradition of fun. No visit to Düsseldorf would be complete without paying a visit to the longest bar in the world. 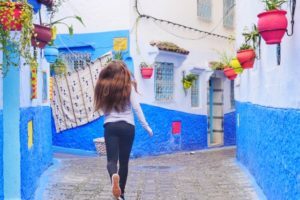 It’s not one bar, but many lining the cobblestone streets where locals and tourists alike gather to eat, drink and be merry. 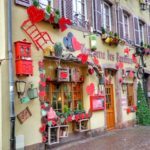 With over 260 bars in the Altstadt, you’re sure to find a pub with a beer you love! Want to explore with an expert? Join a nightlife pubcrawl! As I boarded my flight from Düsseldorf to Lisbon, I lamented all the food I’d not yet eaten and altbier not yet drunk. 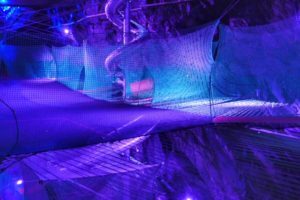 It sounds like a great excuse to come back… perhaps in summer next time to sit on the banks of the river, sipping Altbier or paying a visit to the biggest funfair on the Rhine. Or maybe to take a cruise down the Rhine itself. Have you visited Düsseldorf? 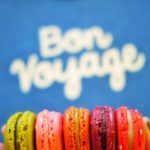 Is your favorite foodie adventure on the list or did I miss something? Let me know in the comments! Note: Some of these activities were hosted by Visit Düsseldorf. As always, all opinions are my own and I’d never recommend anything to you that’s not awesome! 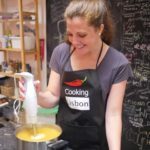 3 foodie experiences in Lisbon you have to try!